Freyssinet did the heavy lifting work in this project. Freyssinet has provided lifting methodology, design of temporary structure and of course the execution of lifting work. Trusses to be lifted to roof position, 7th floor, 5th floor, and the shortest lifting is for the 3rd floor with the heaviest truss has weight about 60 tons with 52 m length. 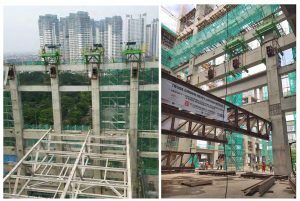 The highest lifting is for roof truss which height is 50 m.
Besides heavy lifting work, Freyssinet also supply and and install 40mm & 50mm Post-Tensioning Bar to connect truss support to the column.